There's a great line in the New York Times obituary of Gary Carter that says he "may have led the 1986 Mets in hugging teammates." Carter has the unique distinction of being the most beloved player for two different franchises during their best years. He once joked that he'd like to go into the Hall of Fame with a half-and-half Expos/Mets cap, but the final decision wasn't his. He wears an Expos cap in Cooperstown, and that's probably right. 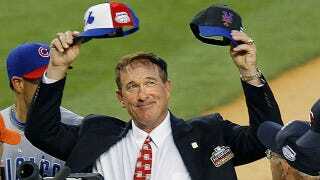 For as much as he meant to fans in Flushing, he had something special with the people in Montreal. In 1992, after a couple of years on the West Coast, Carter came home. On September 27, 1992, in what would be the last at-bat of a 19-year career, he drove a ball the opposite way, over the head of longtime teammate Andre Dawson. It plated Larry Walker, the only RBI in a 1-0 Expos victory. The Olympic Stadium crowd let Carter know exactly how they felt.